If you’ve ever tried to get out of debt, for example, then you know exactly what I’m talking about. Ultimately, I was ready to give up my search. Plenty of books, audio programs, and seminars had counseled me to “think positive,” “dream big,” “have faith,” etc. ; but for some reason I lacked the will power to maintain the mentality they described. I realize now that I couldn’t do it, simply because I didn’t understand why I needed to guard my thoughts. I didn’t realize how the Universe really operates. Once I understood the big picture a little better, thinking positive, dreaming big, and having faith came much more naturally. Once I began to think right, circumstances began to change. Good fortune began to come our way predictably. When I faced a challenge, I finally knew how to turn it into a benefit. I began to work with God to attain all that I needed in a wonderful way. I thought I understood faith before… but now… I feel I have a whole new understanding of the word. 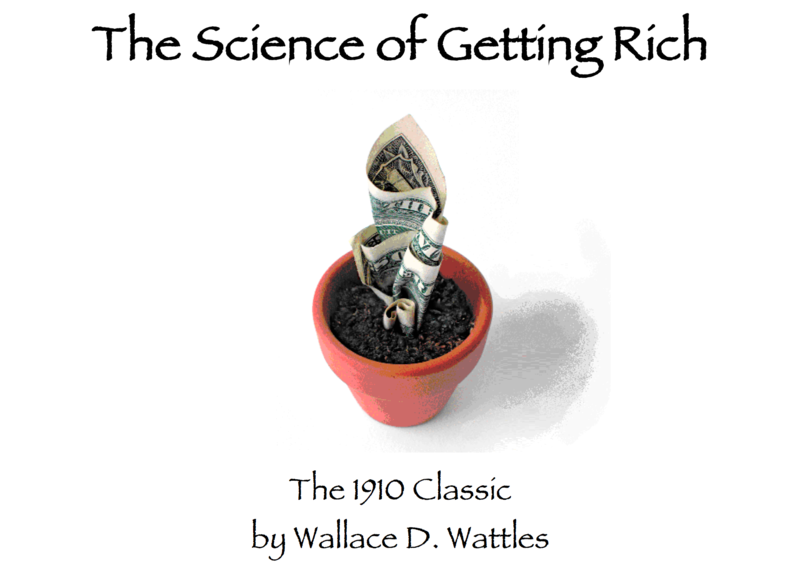 I am pleased to present to you the century-old classic, “The Science of Getting Rich,” by Wallace D. Wattles. Out of this book was born my best-selling book, “The Jackrabbit Factor: Why You Can” which is essentially The Science of Getting Rich, story form. You can get out of a financial hole. You can even make great leaps forward, like you never thought possible. But even better than that, you can fly the way God intended you to fly. Some of the words in this book may be considered “old-fashioned” or out-of-date. Please do not be offended by masculine references to individuals. These principles apply just as surely to women as to men. I am certain Mr. Wattles would agree, and intended no offense. Also note that some of his comments were made in the historical context of 1910. I have found two or three points that I do not agree with, 100%. I’m not certain that that means we necessarily disagree. It could be that the meaning intended would be worded differently, today. Regardless, I embrace the majority of this work, and have enjoyed an abundance of good fruit from its teachings. It has given my husband and me the knowledge we needed to be able to keep me home with the children (a dream of mine), and help my husband find a career that is satisfying as well as profitable. For us, these blessings equate to the strengthening our family… the ultimate source of our greatest joys. I know you have dreams, too. Dust them off, because now is the time for you to begin achieving each of the worthy desires God has planted in your heart.